In BricsCAD, you can create up to 255 layouts in a single drawing. Each layout represents a sheet of paper. For each layout you can specify the print area, print scale, lineweight scale, pen mappings, and add viewports, dimensions, a title block, and other geometry specific to the layout. The entities you add to a layout in paper space do not appear in model space. Each layout requires at least one layout viewport. If the CREATEVIEWPORTS system variable is ON a viewport is added automatically in a new layout. If this variable is OFF, newly created viewports are empty. To add new layouts you can either define them yourself or your can import layouts from another drawing: template file (.dwt), drawing file (.dwg) or drawing interchange file (.dxf). Viewports can display all or part of the drawing’s model space entities. The CACHELAYOUT system variable controls whether the content of layouts is cached. The extra memory required for caching is made up for by improvements to the memory requirements for displaying entities, the net result being that the memory needed to display drawings has been reduced. As a result of this switching between layouts is up to 10 times faster now. The Ctrl-PgUp or Ctrl-PgDn keyboard shortcuts allow to open the next or previous layout. Click the New Layout tool button ( ) on the Layout or the Insert toolbar. Choose New Layout in the Insert menu. Type layout in the command bar, press Enter, then type N and press Enter. Type a unique name for the layout, then press Enter. The name can be up to 255 characters in length and can contain letters, numbers, the dollar sign ($), hyphen (-), and underscore (_), or any combination. Right click or press Enter to accept the default name (e.g. Layout1). The new layout tab is added. 3. Create at least one viewport (see Creating viewports in a layout). If the CREATEVIEWPORTS system variable is ON a viewport is added automatically in a new layout. Right click the layout tab you want to copy. Type a new unique name in the command bar, then press Enter. A copy of the selected layout is added. Right click the layout tab you want to move. Select the number of tab positions. Choose Move to Last Layout or Move to First Layout . Right click the Model tab or one of the layout tabs. Choose From Template... in the context menu. The Select Template From File window opens. Browse to the drawing that you want to import layouts from. Click the Open button on the Select Template From File window. The Insert Layout(s) window opens. Select the layout(s) you want to import. Press and hold the Ctrl key to select multiple layouts. Click the OK button on the Insert Layout(s) window. The selected layouts are imported. Double click the layout tab you want to rename. The Rename Layout dialog opens. Type a new unique name in the Name field of the Rename Layout dialog. Click the OK button on the Rename Layout dialog. The selected layout is deleted. Choose Drawing Explorer > Page Setups... in the Tools menu. Choose Page Setup... in the File menu. The Drawing Explorer - Page Setups dialog displays. 2. Select the layouts you want to delete. To select a series of layouts: select the first layout, then press and hold the Shift key and select the last layout. Press and hold the Ctrl-key to add/remove layouts. 3. Click the Delete tool button ( ) in the toolbar on the Drawing Explorer - Page Setups toolbar. 4. 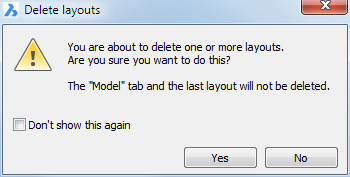 Press the Yes button on the Delete Layouts alert box.